Former Major League Baseball star and Cherry Hill native Orel Hershiser made his way from the mound to the broadcast booth—and, at 52, his aim is as sharp as ever. Orel Hershiser captured the hearts of baseball fans everywhere during his magical 1988 Major League season. These days, Hershiser serves as a broadcast analyst for ESPN, sharing the knowledge he gained over a 17-year playing career every weekend as part of the national Sunday Night Baseball crew. Hershiser first stepped into the role last season alongside longtime announcers Jon Miller and Joe Morgan. This year ESPN reshuffled the lineup, pairing Hershiser with his former broadcast partner, Dan Schulman, and former manager, Bobby Valentine. We sat down with Hershiser during a rare break in his schedule to talk about his South Jersey days, watching the game from the press box, his interest in buying the Dodgers and why he only recently started wearing his World Series ring. 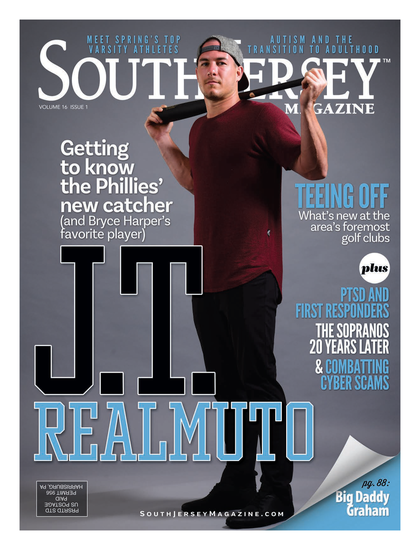 SOUTH JERSEY MAGAZINE: Last year, you entered the Sunday Night Baseball broadcast with two Hall of Famers; this year you’re back with a former partner and manager. How has the experience been thus far? OREL HERSHISER: The first experience was an honor, being added to the crew that covered me when I was an active player. I told [Miller and Morgan] that I had such a bad year that I lost both of my teammates [after their contracts were not renewed by the network]. Dan [Schulman] is the best point guard in the business, and I don’t say that lightly. Nothing about him is going to be in the broadcast. He was the voice of Sunday Night Baseball on the radio, but this forum will give him exposure. SJM: Did you always have ambitions of a broadcasting career? OH: I pretty much had aspirations to prepare myself to do anything, whether that was coaching, managing, front office, broadcasting.… I was always listening and learning. People thought I was a little over the top, wondering what was going on in their industry. But I knew I was only going to be a player for a short while compared to the rest of my life … and I’m not much of a bingo player. SJM: Tell me about your partnership with fellow former Los Angeles player Steve Garvey as potential buyers for the Dodgers, should the financially troubled team go up for sale. Is being an owner something that you’ve been wanting? OH: That’s a new investigative phase in my life right now. I’m excited to investigate the possibilities; you never know what’s going to happen, but you want to be educated. A lot of good things have happened since I voiced that possibility. I learned that I still have a solid voice in the L.A. community that people respect. I’ve really kept my distance from the organization over the years, but if the right situation came up, it would be fun. SJM: What about managing: Could you ever see yourself back in a Major League dugout? OH: Managing or coaching would have to be the perfect storm; there’s only 30 of those jobs. And I’m honored to sit where I sit right now; there’s only two of those jobs. I don’t need to run away from my current job. I have three more years left with them, and I can’t wait to stay with them for a long, long time. But, [ESPN] always knows that people are going to be courted for other opportunities. SJM: Back when you were on the mound pitching for Cherry Hill East, did you dream of the career that you had? OH: No way! I always tell people I was a suspect, not a prospect. And I was doing all the suspecting. I was drafted in the 17th round as a junior in college, and I didn’t even make the team at Bowling Green [State University in Ohio, at first]. My thing was, I could pitch well enough to go to college. I wasn’t a big-time athlete—I just got an opportunity. During my time at East, my head coach, Dave Martin, did a fantastic job with my life and was a great mentor. He was teaching me how much work it would take to be good at something, not just baseball. SJM: What were your hangouts back then? OH: Some people would laugh, but there was an ice cream place called the Strawberry Patch. I also worked at an Exxon station on the corner of Route 70 and Kresson Road for three years, and my mom would bring my dinner up to the corner. So even though I so-called, “made it,” I respect everyone. I was a window washer, I mowed lawns, I did all those things as a kid through college … and I pretty much learned my work ethic from doing those jobs. SJM: Since you see a lot of teams working for ESPN, I have to ask: What do you think about the Phillies this year? OH: They are doing what I thought they were going to do, but their offense is a little weaker. They might just end up blowing this thing away … with [Chase] Utley back and [Ryan] Howard, there’s a lot of offense coming their way. I’m not sure Ruben Amaro Jr. will get Executive of the Year, but they’re sure winning the same amount of games with far more challenges than anyone expected. SJM: Would you have liked to pitch on a staff like theirs? OH: Of course, but I don’t know if it’s because of the good staff or the good offense! SJM: Who is your favorite pitcher in the game today? OH: Roy Halladay, because he is right handed and how he pitches as a right-hander. Of course, there’s C.C. [Sabathia], Cliff Lee and Cole [Hamels], but they are left handed and they have a bit of an advantage in that. Halladay is absolutely fantastic, like Greg Maddux with power. Roy does it year in and year out. SJM: Since moving to Vegas, you have become quite the card shark. How did you get into poker? OH: I absolutely love the strategy of the game and the intelligence it takes to understand it. It’s like pitching, you have to think, “Is the wind blowing out? What’s the score? Am I on Astroturf or grass?” [In poker, you think], “Is the big raise going to take the pot down?” There’s just the same kind of strategic outline: you know your moments as a pitcher and you know your moments as a poker player. OH: Almost every day, but it’s not like being an active player. I can stand next to an active player and not get recognized. SJM: You used to not wear your World Series ring. How about now? SJM: Do you ever sit down and watch the 1988 World Series? OH: I haven’t watched it lately, but living in Las Vegas, every once in a while the Fox station that carries the Dodgers will put on old clips with me or [former manager] Tommy [Lasorda]. SJM: You mean during rain delays? OH: Yeah, thanks a lot. I’m a rain delay now!